Indie authors usually include disclaimers in their novels that the characters and events are fiction – but sometimes there’s a fine line between memoir and story. Sue Johnson explains how her planned autobiography morphed from into fiction, and why she’s glad she handled real events and characters from her life in this way. Fable’s Fortune was my first novel, published in 2011. The story began as a piece of autobiography written when I was on a college course in 1998. I began writing about my childhood in Kent, and the words just poured onto the page. At the time I was going through a traumatic divorce and writing helped to put things into perspective. Within no time at all, I had 85,000 words written – but what I had created was unpublishable in its current form. I used lots of the ideas for magazine stories. Many of these were published in women’s magazines (Woman, My Weekly and Take a Break: Fiction Feast). As I worked on these, the real people in my autobiography began to change and become less like themselves. I mixed them up, gave them different characteristics. I created new characters, problems and plot twists. As soon as I was better, I began work on a complete rewrite, this time creating a story rather than sticking to what had actually happened. I used the ‘bones’ of my own life story – but it was a remodelled skeleton! Fable’s life is de-railed three times, once when her estranged father kidnaps her and takes her to live in his vicarage in Worcestershire, the second time when her boyfriend Tobias dies under mysterious circumstances and the third time when she manages to get away from her controlling husband Tony. This follows a fairy tale structure, as do many novels and films. Creating a novel meant that I could deal with the frustrations I was feeling at the time as a result of my divorce. Putting the events and emotions in the heads of various characters was cathartic, especially when they reached a happy ending. People who have known me since childhood can sort the truth from the fiction. Those that haven’t hopefully just enjoy the story! It may sound an odd thing to say, but I am glad I had the attack of vertigo when I did. I was on the point of being discouraged from writing Fable. Two novelists told me not to bother with it because ‘it wouldn’t work’. Thankfully, I have always been stubborn, and this was one story I really did want to tell. I am glad I persevered with re-writing the book and keeping going. OVER TO YOU Have you created fiction out of fact? Do you prefer to stick with what’s real? We’d love to hear your take on the matter. 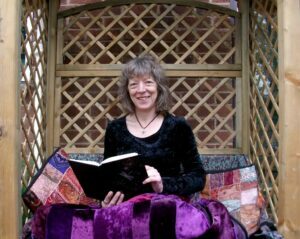 Sue Johnson is published as a poet, short story writer and novelist. She is a Writing Magazine Creative Writing Tutor and also runs her own brand of writing workshops. Further details of her work can be found on her website www.writers-toolkit.co.uk. Ooo, this is quite the inspiring experience! Thank you, Sue, for sharing it! Interesting article and I can identify with it. My memoir about my undercover cop days on the UK’s largest drugs bust, Operation Julie, has sold well. It was written as fact – a true crime memoir. But I have now written a follow-up story which is crime fiction. Almost all fiction anyway! Many of the characters in that novella are based on real people I met while undercover. Some of the lawyers I introduced in the story are also based on real people (I was a barrister for 14 years). Now I have started writing a book about my paternal grandfather who joined the Royal Navy as a boy sailor at sixteen and was discharged in 1945 at the end of WW2.His ship, the ‘Prince of Wales’ was sunk by the Japanese in 1941. I have decided to write his story as fiction based on true events. Good luck with the book and thank you for sharing!